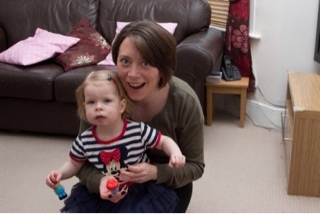 It's not long until I attend BritMums Live 2013 and I'm very nervous and excited, I've joined the BritMums linky so that I can't back out now and hopefully if you see me at the conference you will come and say hello. Yes and I'm looking forward to staying in a hotel room on my own and getting some sleep! Meeting lots of different and inspirational women, hearing the keynote speeches and learning a little more about blogging (and myself). I'm looking forward to stretching myself socially as I can be shy and get stuck in my safe little world. Not sure yet. It's going to involve a shopping trip soon! I'm hoping to get some valuable tips on improving my blog and meeting people I follow online and seeing how they do things differently. I'm a Barry Manilow fan (sort of), I've seen him three times in concert and will keep going back. I've no idea what the draw is and I don't really listen to his music but I keep going back. 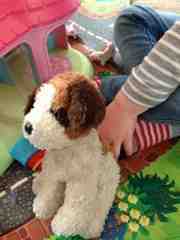 Dylan the dog goes everywhere, I've looked into getting a replacement. 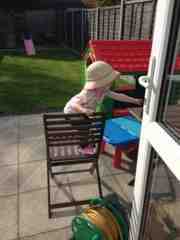 He has his own chair at dinner, watches her have a bath and waits for her in car during nursery. Bubba says sorry even when I've trodden on her feet. Also says please and thank you without prompting most of the time. Gone off toy story and now loves Spider-Man. 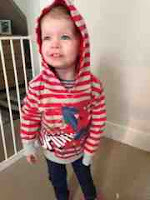 It's all about spidy and she has a sweatshirt with his picture on that she loves wearing. She loves fruit loaf and frozen bagel. Still has two breakfasts a day. After a very minor bout of chicken pox she is now addicted to her dummy. Most of the day she will ask for it, whereas before it was only when she was tired. Shrugs her shoulders and makes her belly dance. 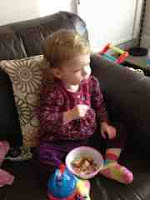 She leans on furniture, she's already a tweenager in the making. The word that comes to mind is 'lolling'. Bubba liked to dance now (wherever she is) when I sing the Spider-Man theme tune. I only know about a minutes worth so I loop it! Exclaims 'dont like beef' when anything unidentified (meat wise) is on her plate. I told her spag boul was brown chicken and she ate the lot. Has started saying she loves things. At the moment it's Spider-Man (or me). 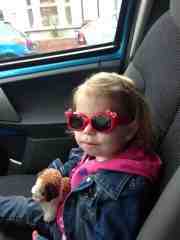 Along with Dylan she carries two little furry dogs and a couple of happyland dogs around with her. It gets exhausting on a trip out making sure all the dogs are with us. She likes to 'drive' now and spends at least half an hour every day sitting in the drivers seat of our car pretending she is taking me to the park to see dogs. Let her sit on the sofa eating breakfast! We do this on my days off work, usually eating fruit loaf or cinnamon bagels in our jammies. We watch far too much television and now bubba loves watching toy story from start to finish. 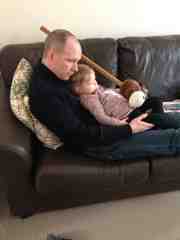 My child is addicted to my phone and she watches toy story clips on You Tube. She can work the phone like a pro and knows all her apps and what they do. I let her paint her own feet in the garden. It kept her interested and busy for she's and didn't take long to clear up. Sometimes breaking the rules is good, it helps you mix things up and allows everyone to relax a little (namely me!). In the grand scheme of things are mumsnet forums going to hang me out to dry for these misdemeanour's or all own up to doing exactly the same things. My darling daughter has been through a few different favourite toys, for a long time it was ducks, then toy story and now it's Dylan the Dog. This scruffy little dog goes everywhere with her. He sits patiently while she eats her dinner, watches whilst she has a bath, plays in the garden and goes to sleep with her. 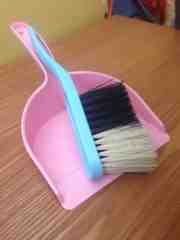 I worry that we may lose him whilst at the shops but I've made sure I know where to buy a replacement (shhhh) if needed. He is very good, I've even caught him wiping Bubba's nose on occasion. In my book that goes beyond the bounds of friendship. We had an awkward time where he wouldn't stop depositing small white pellets (that's until I sewed up the hole in his leg). He is now a lot scruffier than when he started out but he is loved. Sometimes if bubba forgets him and is having too much fun, suddenly she'll cry out for him and won't settle until he is back in her arms. It's definitely true love. My fingers twitch and I have to keep my mouth jammed shut. Why? 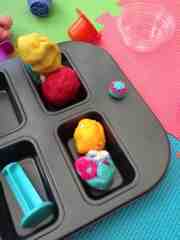 Because Bubba is mixing the play doh colours, it's making me feel all highly strung. I'm not really sure why though, they are complimentary colours so look good all together. 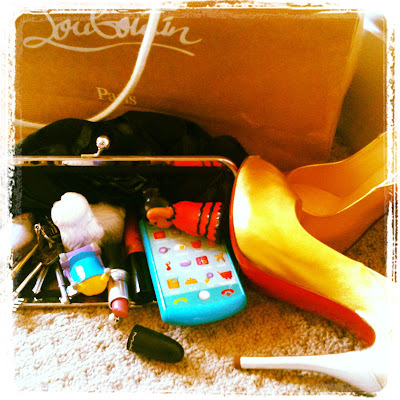 I think it could be that as an adult we are taught to keep things compartmentalized and tidy. We label things in our minds and lives in neat orderly little mental boxes. Children don't have the confines that we do but at what age does this change and why? If you sit and think about it, who cares if the colours mix and what harm does it do? Yep exactly, none whatsoever. It's the art of play and exploration so it makes me sad that I try and control her responses and get twitchy when things get messed up. I must admit once the colours are all mixed I start to relax. I don't really care now but didn't want the lovely pristine things messy. I go into kitchen and pick at food she hasn't eaten (never got the chance when she was smaller as she ate everything!). I'm always saying 'just a minute, I'm coming' as she demands something new. I use small kitchen equipment to clear up because its close to hand (must admit that bubba likes a good clean). I find myself on my hands and knees a lot clearing up bits of Lego, stickers or toys scattered around the room. I managed to get myself a bad back, mainly from doing the above and picking up a toddler. I have to negotiate on a daily basis and listening to a mini tantrum. 'No' is her favourite word (and mine). I can no longer tell you what's in the shops because I never get the chance to browse. Everything is done on hyperspeed, from eating my lunch (so I'm ready for her throwing food, falling off the chair or the like) to going to toilet (which is never alone anymore). My heart was taken the first moment I held her. I had a rough couple of weeks with breast feeding and I tried so hard, nearly lost my mind, became scared of not doing the best by her and came out the other side knowing that I was doing it all for her. I'll always love her, to the moon and back and then some. Even that doesn't explain it, she makes my heart sing and is my reason for doing everything. I like how she holds onto my fingers so hard when we walk along. One finger twiddles my engagement ring (which will be hers one day). I love that ring but would give it to her now if I wasn't so sure she'd swallow it! I'm looking forward to being her best Friend. My mum is mine and the three of us will be like the golden girls or the three amigos! I want us to be able to laugh together, cry together, eat cake together and shop together. I'm so proud of her. 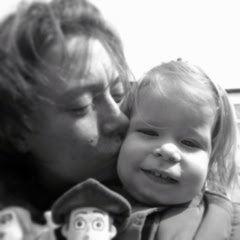 she's only two but I can't believe how wonderful she is (I know we all say that). She should know she is already smarter than I am and could run rings around me if only she could harness her power (who am I kidding, she already does this). One cuddle is never enough. I have to force myself to put her down to sleep when she rests her head on my shoulder and pats my back. It turns my heart to slush. I'm a cuddle stealer now, any opportunity and I'm there like a shot as she tries to push me off! My advice to her would be to 'be true to yourself', and not worry about what everyone else is doing. This is something I struggle with and I hope it passes her by. I hope she can shrug and say 'I'll do it anyway' when people are negative. Study and learn and listen to others. These are the keys to a big wide world. Enjoy learning and you can open doors and do almost anything you want. I've always enjoyed reading and learning, it makes the world around you a more vibrant place. Her daddy is the most important person. He loves me through tough times and good times, he understands me. He would do anything for her and only wants what's best for her. He will let her do all the things I'm scared of, like climbing on things, jumping on sofas and going head first down the slide (just taught you that one!!). I usually read a story to Bubba every night, often it's the same old books which I have to read at least twice before bedtime. Recently I ordered a wonderful book that on opening I was met with a gorgeous array of pictures and words - as an adult I found it magical and fun because there is just so much to look at. 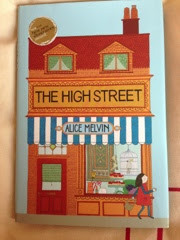 The book is 'The High Street' by Alice Melvin. It's the story of Sally and her trip to the high street to purchase a specific assortment of objects and the art work (because that's what it is) is detailed and amazing. I found it a treat as did Bubba and she often sits very still, almost spellbound, when I read it. It would appeal to more grown up children as well and that's what I like most about it, it isn't just a toddler book and can be enjoyed by everyone. I'm always really pleased when Bubba picks this one for story time because I enjoy reading it as much as she does. 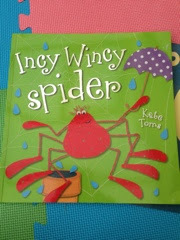 Other books we are starting to read are 'Incy Wincy spider' by Kate Toms, mainly because Bubba likes the song and actions and this ties nicely in with that. I'm trying to teach Bubba her numbers but at the moment she likes to count to three at most and I'm not sure she has really grasped the whole number thing yet. 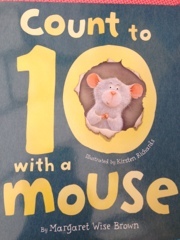 'Count to 10 with a mouse' by Margaret Wise Brown is a lovely illustrated book and I'm hoping it will help Bubba to learn to count. Have you been reading any good books? We are always on the look out for more brilliant reads. This month mother of two beautiful babies gives us some insight into how she stays on top of motherhood. I didn’t think I would love being a mummy as much as I do! Yes, hubby and I don’t go out as much but we appreciate our weekends, family time is so precious and great fun! I’ve always been organised but I think I’ve taken it to a whole new level! I like to be at least 5 steps ahead of what’s coming next and to keep busy I find that it’s the easiest way to keep both children happy! I no longer carry a handbag! I have a nappy bag, a small lunch cool bag and I have big coat pockets that contain all the essentials! 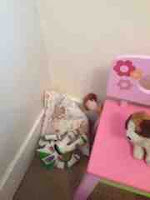 Tissues, wet wipes, nappies, snacks and favourite mini toys (to keep them entertained!). I’ve learnt to pack light over the years and as Evie is getting older they can start sharing more, which makes it easier and lightens the load! My husband. He’s fantastic with the children and cooking! Also their smiles keep me going no matter how tired I am as soon as I hear them laughing it’s a total buzz! I like to get prepared in the evening for the next day, take food out the freezer, pack bags - that way in the morning we can get up and go! A wise old mother once told me to never wake a sleeping baby and trust your instincts – very true. This may sound daft but I grew up with animals and they feed off you, I’ve learnt that it is similar with children. They look to you all the time for reassurance, if you are anxious they get anxious, if you are happy they are happy and they’re a lot easier to deal with happy! Do you use any good books or websites that you'd like to share? We are lucky to have a really good local website that lists all baby/child related activities and puts them in a handy calendar, www.forsanitysake.com. They also send a really good weekly newsletter that highlights any new groups or local community events. 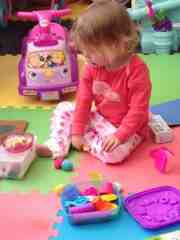 Love or hate her, Gina Ford, I found the books great for routines and weaning. The guides to the amount of food you should introduce and when was great. I didn’t follow the routines minute by minute but it has certainly helped me have two content children! Annabelle Karmel recipe books were also great for weaning and she also has a great website. Can I have two, hectic & happy!